Pretty soon after Episode II hit theatres, a comic series called Star Wars: Infinities took a look at an alternate universe's version of The Empire Strikes Back. 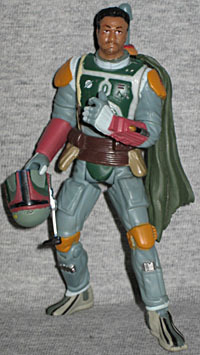 The comic took quick advantage of the new knowledge that Boba was just a clone of Jango by showing us the first images of an unmasked Boba Fett. However, we have yet to get an action figure that followed suit, so I made my own. 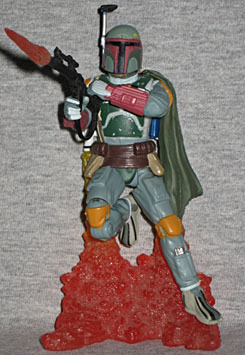 The body was originally from the Pit of Carkoon Boba Fett figure, and the head was from Kamino Escape Jango Fett. The neck joints were different types, and Jango's refused to pop off, so I ended up just cutting them off and gluing them together. The paints all had to be custom blended to match the body - none of those colors came stright out of the bottle. The figure even manages to retain all its original articulation! With the helmet on, you can't tell anything's different, so imagine your friends' surprise when you pull the helmet off to reveal the face beneath. Why hasn't Hasbro done this, yet? Tell us on our message board, the Loafing Lounge.